Air-powered guns are used throughout the world for target shooting, sport, and firearms training. These devices range from toys exemplified by the Daisy BB gun to expensive, highly sophisticated custom air rifles. The device that most people think of when discussing an air-powered gun is the Daisy BB gun. The Daisy is in fact a toy that fires an 0.175-in. steel BB down a smooth bore at a muzzle velocity of 275 to 350 ft/sec. A BB gun can cause serious injury only if the BB strikes the eye. In such cases, perforation of the globe may occur. Based on animal studies, the V-50 velocity for corneal penetration and serious disruption of the globe from a steel BB is approximately 246-249 ft/sec.1 At these velocities, 50% of steel BB's fired at an eye will penetrate. There are, however, other air- and gas-powered guns with considerably greater velocity and striking energy than that of the Daisy BB gun. These devices are more properly classified as weapons as they can cause significant physical injury and occasionally death. Austrian armies used air rifles against the French during the Napoleonic wars from 1799 to 1809.2 These weapons were rifles of 12.8-mm caliber with an effective range between 100 and 150 yd. Air rifles, air shotguns, and air pistols were used for hunting and target shooting during the late eighteenth and early nineteenth centuries. Air rifles are still used extensively for target shooting as well as gun training. An air rifle is a weapon that uses the expanding force of compressed air or gas to propel a projectile down a rifled barrel.2 The term "air rifle" is commonly but incorrectly applied to toys such as the Daisy airgun. An airgun is distinguished from an air rifle in that the airgun has a smooth-bored barrel and may be either a weapon or a toy. Air pistols may be either weapons or toys and may have either a rifled or a smooth bore. The same projectile used in airguns and air rifles are used in air pistols. The standard calibers for air- and gas-powered guns in the United States are the 0.177 in., the Sheridan 0.20 in., and the .22 in. The basic form of airgun ammunition is the BB. These are steel balls having an average diameter of .175 in. and an average weight of 5.5 gr. The most common form of air rifle ammunition is the waisted Diabolo pellet, a soft-lead missile shaped somewhat like an hourglass (Figure 10.1A). The front edge of the pellet acts as a guide riding on the rifling lands of the bore. The bullet is waisted at the center and has a hollow base. The rear edge is flared to engage the rifling and to seal the bore. Diabolo pellets weigh an average of 8.2 gr. for caliber .177 and 15 gr. for caliber .22. The exact weight depends on the brand of the pellet. Because of their extremely light weight, these pellets lose velocity rapidly, becoming harmless in less than 100 yd. Air-rifle pellets can be fired in smooth-bore air guns without any difficulty. The firing of BB shot in a rifled bore, however, eventually results in damage to the rifling. 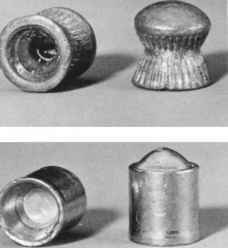 Pointed conical bullets are also made for use in air rifles. The Sheridan air rifle in .20 (5-mm) caliber fires pointed conical pellets averaging 15.3 gr. weight, with a hollow base and a narrow exterior flange to engage the rifling in the bore (Figure 10.1B). The forward portion of the pellet is bore diameter and rides on top of the lands. There are three basic power systems for air-powered guns.2 In the pneumatic type, air is pumped into a storage chamber. When the trigger is pulled, the air is released, driving the pellet down the barrel. Varying the amount of air pumped into the reservoir by varying the number of pump strokes allows control of the velocity of the projectile. Increasing the number of pumps to a maximum can produce velocities as high as 770 ft/sec in a well-made airgun or air rifle. The spring-air compression system uses a powerful spring that is compressed by manual action. On pulling the trigger, the spring is released, driving a piston forward in the cylinder and compressing the air ahead of it. The air is driven from the cylinder through a small port behind the projectile. Air drives the missile down the barrel. Velocities of 1000 ft/sec may be reached by .177 air rifles. Weapons of .22 caliber generally have slightly lower muzzle velocities. In contradistinction to pneumatic guns, spring-air compression rifles have only one power setting. Thus, the muzzle velocity is constant. Both air rifles and toy airguns operate on the spring-air compression principle. In toy guns, however, cheap construction and low-power springs prevent the high performance achieved in quality rifles. The third gas-compression system uses carbon dioxide from a disposable cartridge as the propellant. Carbon dioxide guns may be toys or weapons, rifles or pistols, smooth-bore or rifled. The rifles have approximately the same muzzle velocity as spring rifles of the same caliber. Case 1. During a heated argument between two boys, ages 14 and 17 years, respectively, the 14-year-old grabbed an air rifle from a friend and at a range of a few feet shot the other boy in the right eye. The victim was transported to a hospital, where he was pronounced dead. The autopsy revealed a pellet wound of entrance in the medial half of the right eyelid. 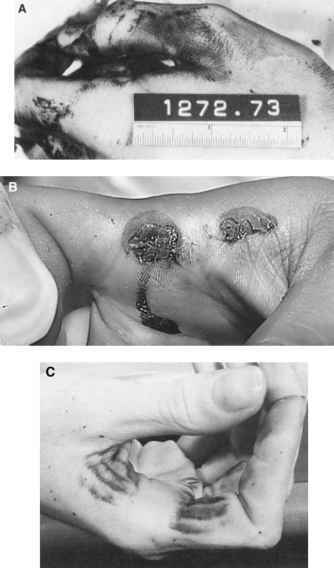 The wound measured 6 mm in diameter, with a 4-mm central perforation. The pellet traveled through the soft tissue of the orbit superior to the globe, not injuring it. The missile entered the cranial cavity through the right orbital plate adjacent to the cribriform plate. The pellet traveled across the ventral aspect of the right straight gyrus, crossed the midline, penetrating the left straight gyrus. It traveled upward, posteriorly and laterally, along the anterior limb of the left internal capsule, coming to rest subcortically in the left posterior gyrus, 5 cm to the left of the midline. A deformed, 5-mm lead air rifle pellet with rifling marks on its surface was recovered. The weapon was a 5-mm Sheridan air rifle with a rifled barrel. Ballistic examination of the pellet removed from the brain confirmed it to have been fired from this weapon. Case 2. Two boys, age 7 and 8, respectively, were playing in the yard with an "empty" airgun of .177 caliber. A cousin who was baby sitting had taken the BB's for the gun away from the boys. The 8-year-old boy pointed the gun at the 7-year-old and pulled the trigger. The weapon discharged and the 7-year-old collapsed to the ground. The boy was dead at the scene. At autopsy, there was a single 5 x 4 mm oval pellet wound of entrance in the left forehead, just above the middle of the eyebrow. The pellet perforated the underlying frontal bone, which was 2 mm thick at this point. The pellet entered the left frontal pole and traveled medially, posteriorly, and slightly upward in the left frontal lobe, exiting the medial surface. It then entered the right cerebral hemisphere, continued left to right, posteriorly, and in a slightly upward path through the right cerebral hemisphere. A standard .175-inch, copper-coated steel BB was recovered from the right Sylvian fissure. Examination of the gun revealed it to be a smooth bore, pneumatic-type airgun of caliber .177. The weapon had a magazine that could hold 100 BB's. When testing the weapon, the author discovered that if a single BB is in the magazine, this BB is not delivered consistently to the firing chamber on working the action. Thus, with one BB in the magazine, it was possible to "fire" the weapon several times before the BB was actually chambered and propelled down the barrel. An individual unfamiliar with this eccentricity of the weapon might assume that the weapon was empty after discharging it a number of times and not firing a missile down the barrel. In fact, a missile might still be in the magazine and might be capable of being discharged on another firing. Case 3. This was a 12-year-old white male shot in the left chest by a friend with a .22 Benjamin Pump air rifle. The wasp-waist diabolo pellet perforated the second intercostal space and the pulmonary artery, penetrating the descending aorta just below the origin of the subclavian artery. The pellet was carried by the blood to the right femoral artery where it lodged. There was a 100 ml hemopericardium and a 220 ml left hemothorax. a Pellet did not leave barrel. without causing any damage. The only evidence that the pellets had struck the bone were 6 x 7 mm smears of lead at the point of impact. The second death was caused by a smooth-bore pneumatic .177 air gun. By virtue of its high muzzle velocity, this gun is a weapon rather than a toy. Table 10.2 lists the average muzzle velocities for this particular air weapon as determined by the author for different numbers of pump strokes. Also listed is the muzzle kinetic energy at these velocities. All tests were conducted using BB's, as this was the form of missile that caused death. The weapon used in Case 2 is relatively ineffective if one considers its muzzle energy. Death occurred in this case because the thin (2-mm) frontal bone of the child permitted the missile to enter the cranial cavity.